Footpath 2 - Begins across the dual carriageway opposite Ravenscroft Lane. 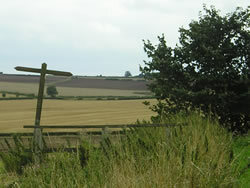 Cross the little "trip trap" bridge and over the stile into the field and along to the corner point where the path veers to your right across field and then heads directly towards South Sandy Furze Farm in the distance. This path runs parallel with the Gringley Road on your right. The footpath ends at the corner of the field where it meets the road but you can continue along this road (Wood Lane) westerly towards the farm where footpath 2a begins. Footpath 2a - Go directly through the farmyard and follow the footpath sign out the other side and continue in a westerly direction across fields. Evenutually you meet footpath 3 and this is the point at which footpath 2a finishes. Footpath 3 - From the point at which footpath 2a joins 3, either go northwards which brings you to a layby on the Gringley Road or southwards takes you back to Wood Lane.